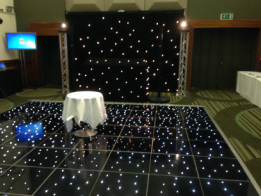 We can supply LED starlit dance floors in black or white (or chequered), groovy video dance floors and acrylic black and/or white dance floor available in any size. We can also supply a parquet dance floor, again to your specification. Standing at over 3' tall these letters will enhance any wedding.